Welcome to Eid sms bangla. Eid is the biggest fastival in the world for all muslim nations. In this special day everyone share many happy wishes with their friends and family. To enjoy this day, people do something special for wishing to their special persons.Bangla Eid Sms. If you want to wish someone special in this day, you should take the best and new wishes and cards from our site. We have shared and posted so many wishes and greetings for eid day. We always try to give special and amazing pics and photos to our all users. Here you will get huge collections of eid sms bangla. Get more bangla eid mubarak sms. These sms specially for your friends. If you share these sms with your friends, they will be more happy. All of these sms are very nice and new. Your friends will be happy surely. You can share these sms on your facebook wall or whatsapp status. bochor jure tomar tore eid asuk neme. keu tomar kono onistho korte parbe na. R amr ei sms tmk dier suveccha janay. bondhu eid card dite parlam na dure bole, mukhe bolte parlam na number nai bole, tai sms a bolchi sundor hok tmr eid er din, dawat roilo ogrim. In this section, you will get some eid sms bangla to laugh someone. With this sms you can do two in one. You can send sms and can give some fun with this sms. These sms are so funny and nice. 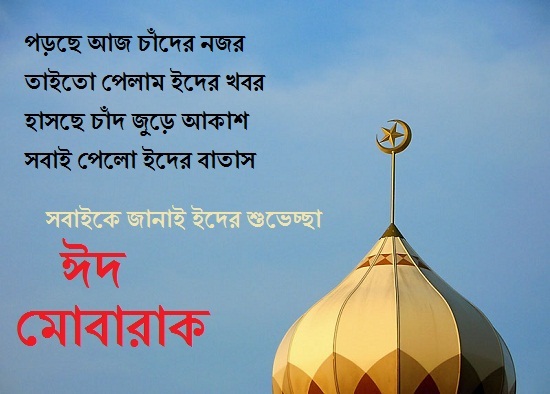 Just make your eid day more funny and joyful with these bangla eid sms. 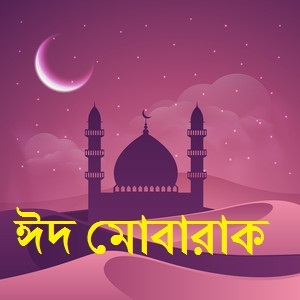 Eid mane khusi, gorur golay roshi, shiter sordi kashi, abar hujurer mukhe hasi, tobuo eid valobashi, tai sobaike eid mubarak janiye ebar ami asi. Eider suveccha janai tmk, onek beshi khusi ghire rakhuk tmk, sob apon joner maya matiye rakhuk tmk, shudhu jokhon salami pabe mone korio amk. Eid sms, jar kache jabi, jake pabi, takei amr salm dibi, lal golaper valobasha diye eider dawat janabi, R misti kore bolbi Eid mubarak. If you love someone and you think eid day is the best day to show your love. You can send these sms to your lover. With these bangla sms you can give your heart love to your girlfriend. So you can send your love with the wishes of eid mubarak. This is the best and romantic way to celebrate yor eid day. eid mane tomr proti amr valobasha. eid mane sukhe sagore sobai mile vasi. 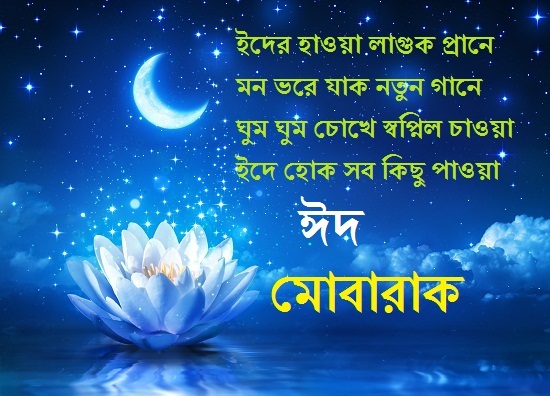 Ei pobitro eid a Allahr oporishim asirbad tmr upor poruk, tmr jibon sukh , anonde poripurno thakuk, Eid Mubarak. sopno gulo sotti hok, sokol asha purno hok, dukkho gulo dure jhak, sukhe jibon vore jak, jibonta hok dhonyo, eid mubarak tmr jonno. Eid mubarak. We love bangla kobita. 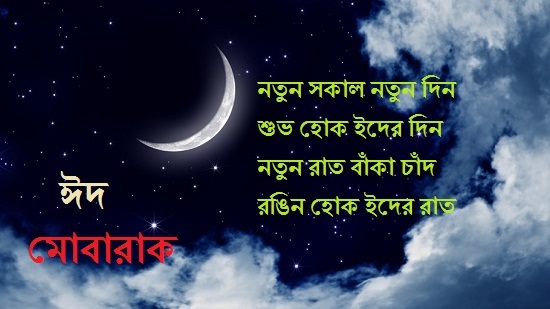 So if you can send the eid sms with the best and romantic bangla poem, then it will be more attractive and colorful for eid day celebration. So you can send bangla eid sms with best bangla kobita. Everyone will be more happy for these bangla sms and poem. So lets enjoy your nex eid day witht best eid poem. tai protita jiboner protita somoy shuvo hok. namaj sheshe bari fire gosto diye khabo. jabar bela tara abar gosto nibe hate.